I have always been a hard worker and at a young age worked in various management positions. I started in restaurant management at age 18, and then transition to the position of Warehouse Manager for a high-end women’s fashion line. 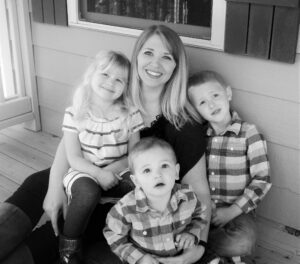 Realizing I hadn’t found my passion, I returned to college full-time at the age of 23 and after 4 years of school and 2 kids, I knew I didn’t want a job that would require me to be away from them all day! So, I specialized in health and fitness, obtaining certifications in both personal training and nutrition. I was able to work when I wanted and it was truly fantastic. With the birth of my 3rd child, however, I found I had less time to work but my bills were growing! When I was first introduced to Mom’s Making Six Figures, I knew a lot about working from home but had yet to find a business that provided both the flexibility and income I needed. What I saw in Moms was an opportunity about which I could be passionate; the time freedom and income potential matched up with the ability to help other women like me achieve those same things for themselves! My business has changed my life in so many ways, from having more time with my 3 kids, to easing the financial burden off of my husband’s shoulders, to teaching other women how to work from home. I’m so thankful for the amazing women of Mom’s Making Six Figures, and the wonderful opportunity we share.